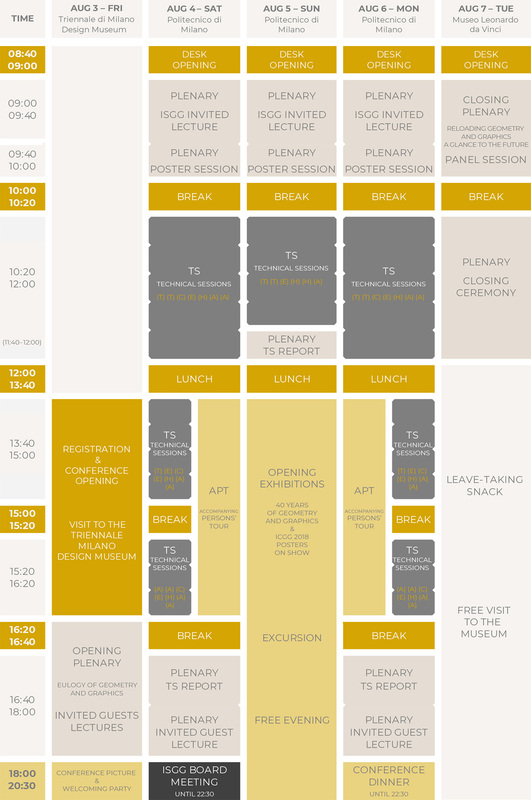 The ICGG 2018 Program (still tentative) is summarized in the diagram at the foot of this page, here a summary of the scientific and social activities envisaged is outlined. On August 3, 2018 the Conference will start, at the Triennale di Milano, and from August 4 to August 7 2018 it will be hosted at the Campus Leonardo of the Politecnico di Milano, the historical headquarter of our University. For the oral presentation of the posters in the pleanary poster sessions, the pdf version of the graphic poster (originally size A0) will be used; this unique rich picture should suffice considering the short time of the presentations (about 2 minutes each); however, if you exceptionally need otherimages in addition (i.e. to focus on some relavant details), please use the templates for Technical Sessions downloadable above, without the frontispiece-slide; in any case, indeed, the graphic poster will be the first image presented, in order to have a unitary style in the session. Is the Constructional Drawing an International Language for Engineers?